Coffee and Espresso, Just a Click Away! The Delonghi BCO264B Esclusivo Cafe Nero Combo Coffee and Espresso Maker enables you to easily prepare two types of coffee. You have the choice of making the usual drip coffee or the frothy espresso. With the Delonghi BCO264B Esclusivo Cafe Nero Combo Coffee and Espresso Maker’s combo feature, you can simultaneously have both types of coffee. You can quickly prepare coffee or espresso through this coffee maker’s separate water tanks and controls, providing you with coffee with just a click away. Entertaining family and friends at home or guests at work is more convenient with Delonghi BCO264B Esclusivo Cafe Nero Combo Coffee and Espresso Maker. With its brewing system patented by Delonghi and a dial to select the strength of your coffee, you can quickly prepare 5 cups or 10 cups of coffee. The Delonghi BCO264B Esclusivo Cafe Nero Combo Coffee and Espresso Maker also features a digital timer which you can program into 24 hours. This coffee maker also has patented filter holders designed for coffee grounds or pods as well as an automatic self-primer that is perfect for its cappuccino system. To top it off, its boiler is made of stainless steel to ensure that your espresso will not have that burnt taste. The Delonghi BCO264B Esclusivo Cafe Nero Combo Coffee and Espresso Maker weighs 13 pounds and measures 17.1 x 16 x 12.3 inches, small enough not to crowd your kitchen countertop or office coffee table. The Delonghi BCO264B Esclusivo Cafe Nero Combo Coffee and Espresso Maker offers you a choice of drip coffee, cappuccino maker and pump driven espresso. All these functions are easy to use and can quickly make coffee. The Delonghi BCO264B Esclusivo Cafe Nero Combo Coffee and Espresso Maker also features a Flavor Savor brewing system designed to saturate coffee grounds to draw out the rich flavors of coffee. Its filter system also eliminates the use of paper filters. The Delonghi BCO264B Esclusivo Cafe Nero Combo Coffee and Espresso Maker also features a warming plate to ensure that your glass carafe which can contain up to 10 cups remains hot. Complaints on the use of the Delonghi BCO264B Esclusivo Cafe Nero Combo Coffee and Espresso Maker are varied. Some users claim that the quality of coffee it makes is just average and it produces weak espresso, a disappointment after expecting so much from its features. Other complaints focus on its design, not very stylish and just look cheap. Its durability is also questionable as several users complained about how some of its functions just stopped working. 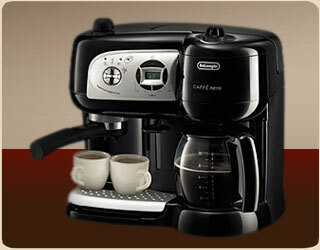 DeLonghi EC155 Espresso Maker : A Cup of Excellent Frothy Drink Anytime!